Let’s face it, children may not be as interested in wearing sunglasses for fashion purposes, but that doesn’t mean they need them any less than adults do. In fact, the sun can be extremely damaging to the developing eyes of children. Kids spend a great deal of time outdoors, and as a consequence, they are exposed to solar ultraviolet (UV) rays on a regular basis. First Eye Care is proud to offer a wide variety of styles and sizes of children’s sunglasses, allowing you to choose the right pair for your child. 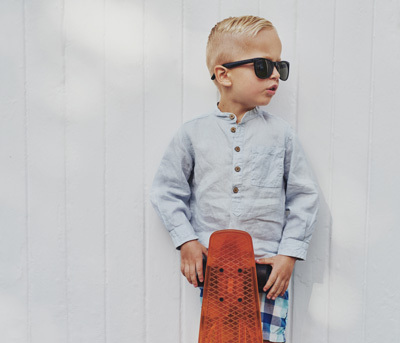 In addition, we have both prescription and non-prescription sunglasses for kids, all of which offer 100% UV protection! Individuals - both children and adults - who wear prescription eyeglasses should also look into prescription sunglasses. Prescription sunglasses offer added protection for your eyes and are one of the more fashionable options on the market today. If you want clear vision during outdoor activities or when driving on a sunny day, stop by one of our three convenient First Eye Care locations in the Dallas-Fort Worth area and ask about our prescription sunglasses. We have a wide selection available, including styles for men, women, and children. From high index plastic and progressive lenses to lightweight frames made from durable polycarbonate or Trivex, we’ve got it all. Sunglasses are a key element in protecting your eyes and your overall health. To learn more about our sunglasses options or to schedule an appointment for a fitting, please give us a call or stop by one of our locations in Hurst, Keller, or Roanoke.